I hate pinching pennies … I really do. Life is way too short not to enjoy the world around us. I want to be able to do things that my family and I enjoy. Usually these things take money. But there is only a limited amount of income that my family earns at this point (although we are working on increasing it). So it comes down to making choices on where to spend our money. We end up spending money on the items we want to afford and give up those things that we don’t want to afford. One of the things we absolutely want to afford is our savings. It may sound odd … but we want to pay ourselves back first by saving more of our income. Then all those savings can be used to invest in assets (ie. dividend stocks) that will earn us more … income! Each month we have been tracking where our money was spent. Where Did We Spend Our Money in February (2017)? Here is a high level breakdown of where we spent our money in February. We also keep a more detailed breakdown of these categories … but won’t discuss today. Housing expenses made a big jump last month for us. Our annual home owners insurance was due in February, which was the reason for the increase. Other than the insurance payment, we paid our monthly mortgage like any other month. So now that our property taxes (paid in December) and home owners insurance (paid in February) are taken care of, we should see our housing expenses level out the rest of the year. A typical month would have our housing related expenses around 25% of our spending. If it wasn’t for housing, food would be our biggest expense. Going forward, most months our food spending will be the most … unless our savings passes it. Our family is comfortable spending more money on food. We feel that buying fresh, organic foods is a valuable investment … more than any stock we could buy or rental property. Investing in our health is a priority for our family and a big reason why we rarely have medical expenses. So if that means spending a couple hundred dollars more a month on healthy foods, then that is an investment we are willing to make. This was our first month with 2 car payments! Not exactly something I was looking forward to, but something we are willing to afford. In addition to the extra car payment, we had an additional insurance payment to make for the new vehicle. I really don’t like 2 car payments, but the good news is that we have just over a year remaining on our first vehicle. We did a much better job in February using our income for savings. It was disappointing that we saved under 12% of our income back in January. We still need to push our savings back to 20% of our income and then eventually to 25%. There is always a trade-off however and last month it was paying our home owners insurance. Looking forward, I think we should be in a better position to save, save, save now that the holidays are over. Not to mention a couple other big expenses are out of the way (i.e. property taxes and homeowners insurance). Our main focus for 2017 is to save as much as we can. And the best way to do that is through dividend stocks. A warmer winter means lower utility expenses! We had a very warm February, which meant less need to heat the home. This trickles down eventually to lower utility bills. Plus, we are over the holiday period now where we paid more in electricity to light and decorate our home. In addition to heat and electricity, we are also including other utility like items here. Cable, internet, and home phone make up a decent percentage of costs. 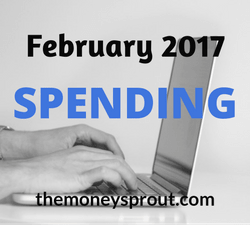 Our miscellaneous category or “other” spending stayed about the same compared to last month. This category includes expenses for items like gifts, vacations, sports and school expenses, and anything else that doesn’t fit into one of our main groups. Even though we plan to start paying these expenses from a business account, we haven’t been able to yet. The good news is that we didn’t have any business “business related” expenses last month. Basically, these are costs that help keep our multiple websites up and running and functioning. I am not content letting our money sit idle in a savings account. We don’t want to be lazy with our savings … so instead we are investing in dividend growth stocks. Last year alone we earned over $1,900+ in dividend income. This year we plan to earn over $2,400 in dividends. I have never really liked sticking to a strict monthly budget. With our family of 5 living off of one income … there are way too many expenses that seem to pop up. That doesn’t mean we throw our money away either, even though we don’t follow a strict budget. We prefer to take care of our most important expense first – that would be our savings. And at least 20% (this month was only 15%) of our income (on average) needs to be saved. After that … we pick the things we want to afford to spend the rest of our money on. Having a home is important to us, so we pay a mortgage. Food is another expense we are willing to spend more on. From our point of view, eating healthier foods is an investment in our health and something we want to afford. Do you track your monthly spending? How was your February spending?